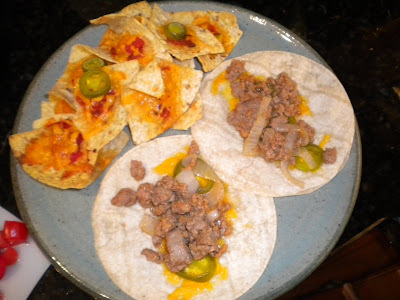 Grass-fed ground beef tacos with oven toasted nachos. 1. Spread large tortilla chips on a baking sheet. 2. Spoon a small amount of salsa on each chip. 3. Sprinkle cheese - I usually use either cheddar or Mexican mix - on top of the salsa. 4. 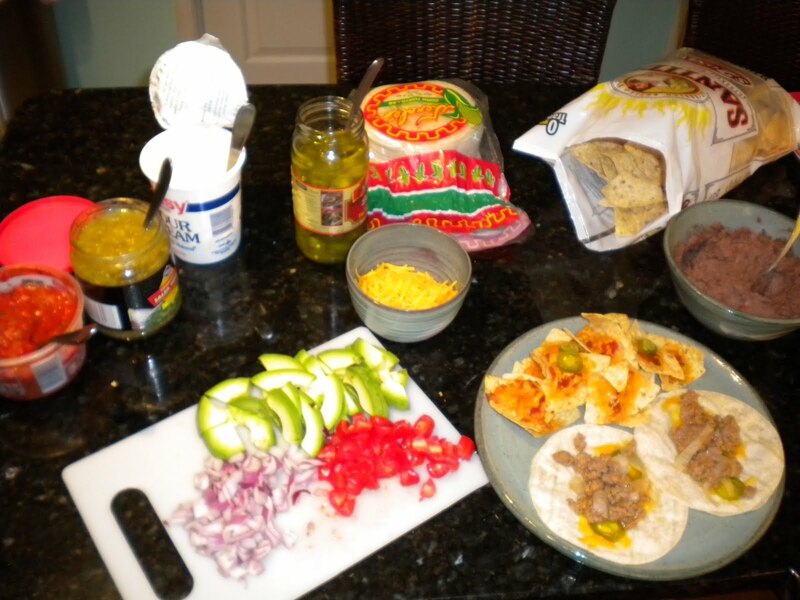 Place a picked jalepeno slice on top of the cheese (optional). 5. Bake for 5 - 7 minutes, remove and serve as soon as possible. I also toast the tortillas with cheese before putting in the remainder of the fillings. Yum! The setup with all the accompaniments - the avocado really makes it better! 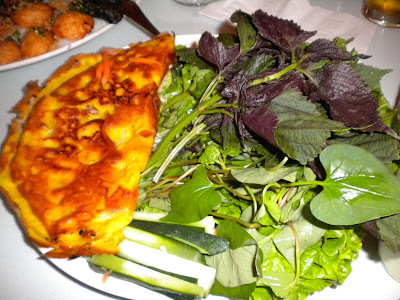 Vietnamese Yellow Pancake (Banh Xeo) - crisp as it should be. While my dad was visiting, he noticed the AJC review of Nam Phuong and despite the distance from home, we decided to try it out on a Saturday evening. 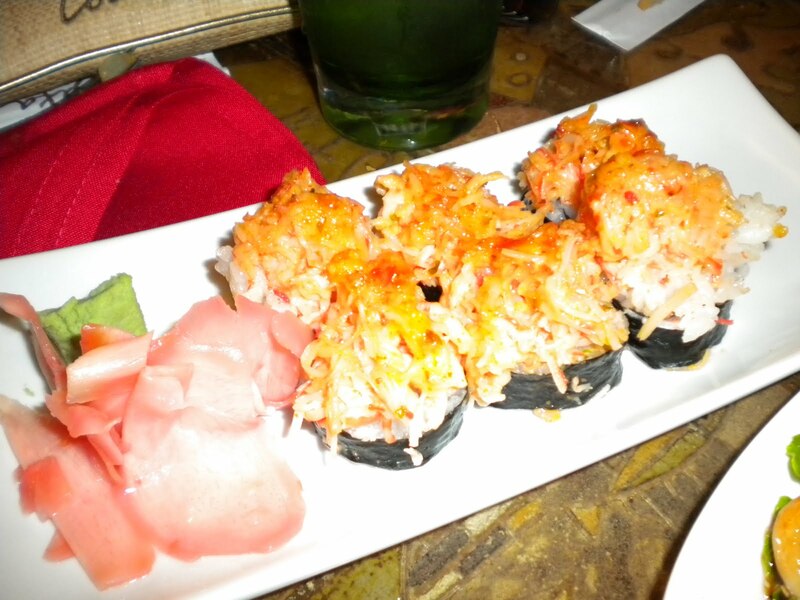 Luckily, we also made a reservation and wound up at one of the nice round tables, perfect for sharing. The restaurant includes two large rooms, the main one encompassing a bar as well as a slideshow of the food - I found this quite amusing! 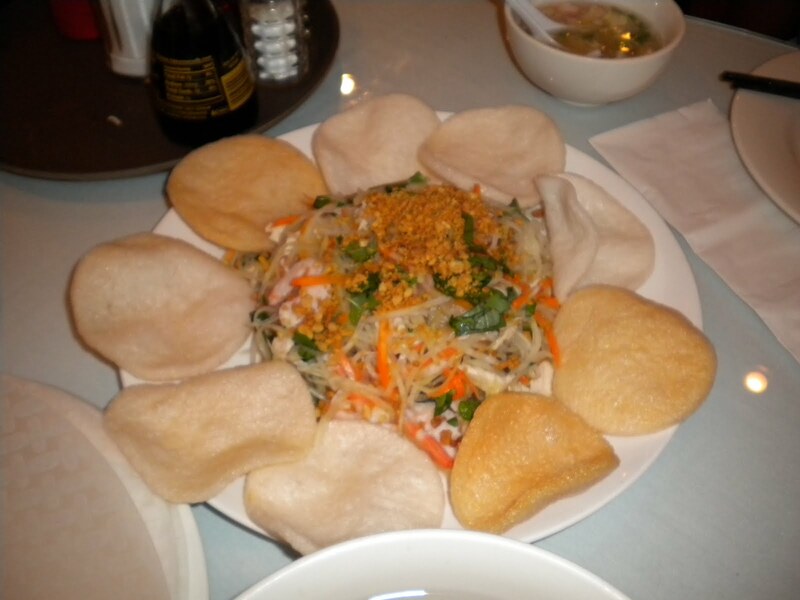 We started with the combination make your own fresh rolls platter (bun hoi), which was wonderful for sharing. I found the beef wrapped grape leaves to be particularly delicious and might opt only for those next time. We also shared a large bowl of seafood soup, simple and satisfying. Although I am a big fan of most green papaya salads (usually at Thai restaurants), here the salads, which we tried with both chicken and shrimp and pork and shrimp, were quite bland and although tasty enough with plenty of crunch, not something I would order again. The salt and pepper squid was well-received by all - in fact we almost ordered more but managed to restrain ourselves. 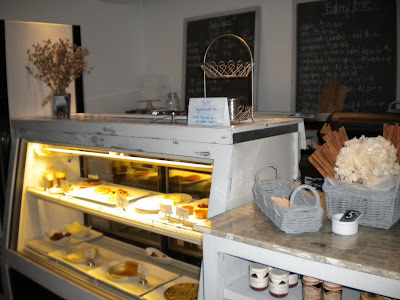 The banh xeo (yellow crepe/pancake) offered here is a stellar rendition also, and something I am always looking for. In my hometown of Charlotte I've found the best Vietnamese food and I've never been able to find a better banh xeo. 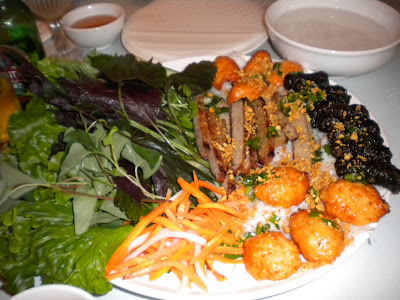 Nam Phuong's version didn't quite make the "better" category, but it was certainly better than any I've had in Atlanta. I also tried the avocado shake, which I enjoyed very much - not too sweet but just creamy enough. This place is made even more interesting by it's surrounding shopping center: Oakbrook Square. There are several other restaurants that look like they are worth checking out here and the Hong Kong Supermarket provided grounds for a thrilling field trip for us after dinner. Nam Phuong is a restaurant worth going to, for newbies to Vietnamese cuisine and for more seasoned diners as well. The AJC's John Kessler recently reviewed Nam Phuong also - and here he provides a demo on how to roll bun hoi! Papaya salad with shrimp and pork. While my mom, stepdad and grandma were recently in town to help me with wedding dress shopping (yes we found something!) 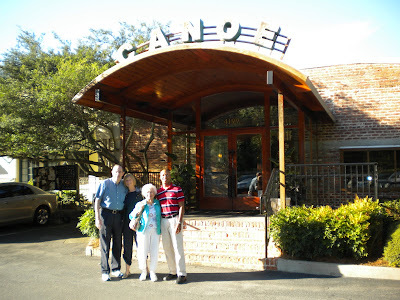 we celebrated my mom's birthday with a memorable dinner at Canoe, a restaurant I'd heard much about but had not yet been to before. The restaurant itself is gorgeous, following the extensive remodel mandated by the 2009 flood that put water more than 4 feet up the walls! Somehow I forgot to think of asking for a window view, so we were in the main room near the kitchen. The noise level was not too bad and we could all hear each other. 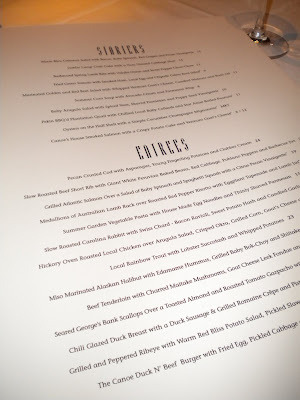 Our waiter was excellent, delivering more of the wonderful bread for us and promptly bringing my grandma a side of mashed potatoes when she didn't care for the edamame hummus served with her halibut (the fish, she proclaimed delicious). 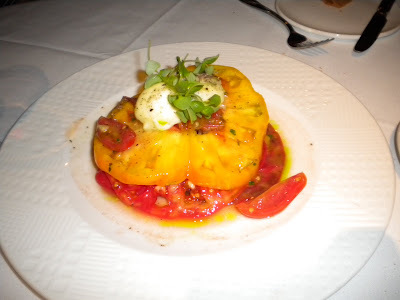 Special off-menu salad: heirloom tomatoes with olive oil sorbet. The menu - lots of great choices! 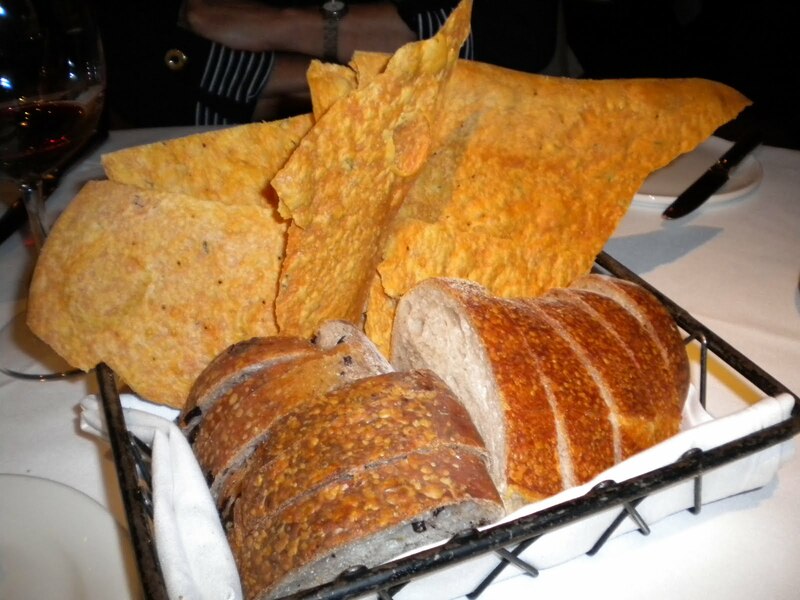 The bread basket was a highlight for all. Grandma loved the chili-rubbed flatbread and we all enjoyed the fresh based olive bread. 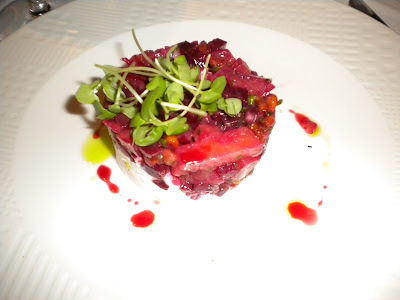 Beet and goat cheese "salad". 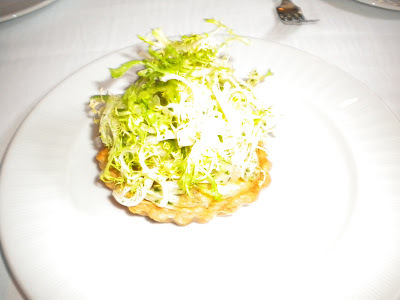 Baby arugula salad - tasty but pretty basic. 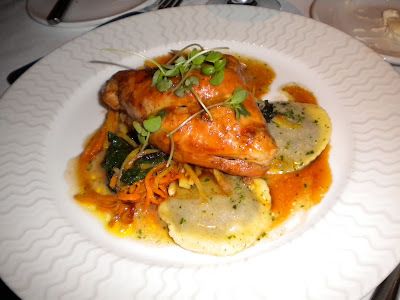 Rabbit with homemade bacon ravioli - divine and different. The dish I ordered, scallops over toasted almond and roasted tomato gazpacho, also pleased the palate. 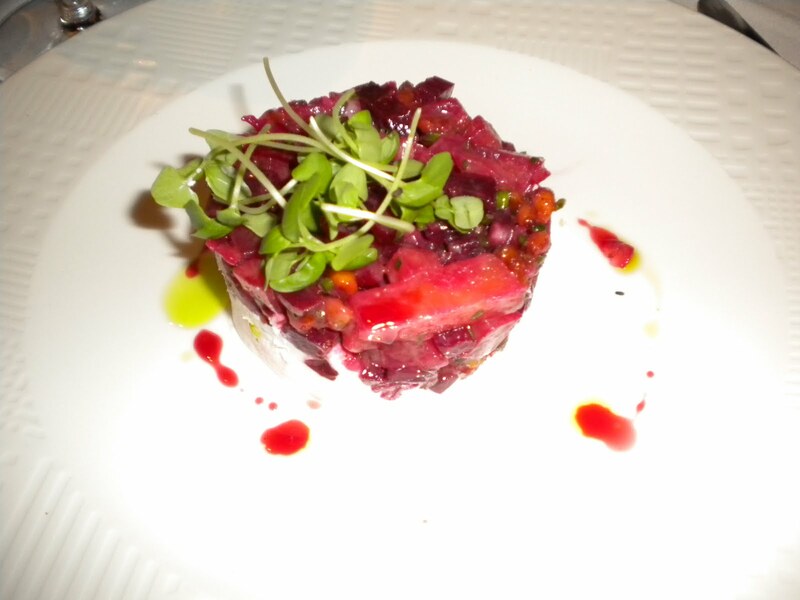 Somehow the photo disappeared, but it was served on a long, slender plate for a dramatic presentation. 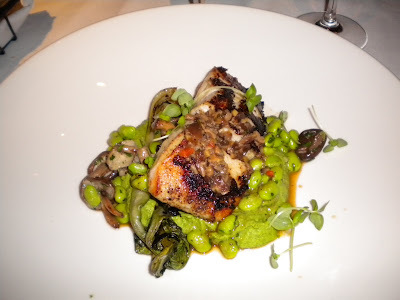 Halibut over edamame hummus with baby boc choi - the sole disappointment of the evening. Once you are inside the restaurant, it feels like you are in another place. It is almost disorienting to come out and see a small strip mall next door - especially one with a weight loss clinic! 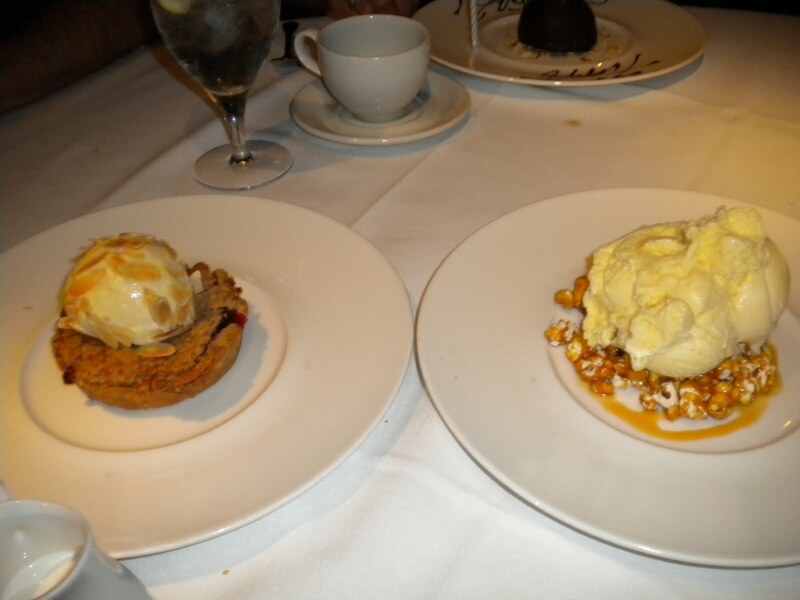 Fruit tart with Vanilla Ice Cream and Homemade Cracker Jack with Butter Pop Ice Cream. The Butter Pop Ice Cream with Cracker Jack = phenomenal and good to the last soupy bite! 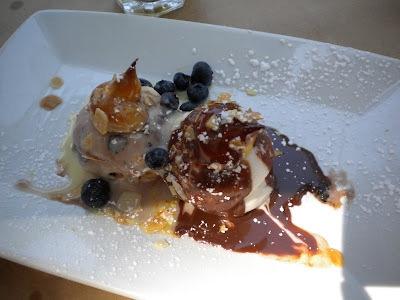 We also tried the chocolate and salted caramel grotto, which looked nice but was nowhere near as tasty as the cracker jack and butter pop ice cream concoction. I do hope to get back to Canoe for brunch, and this time I'm sitting outside! 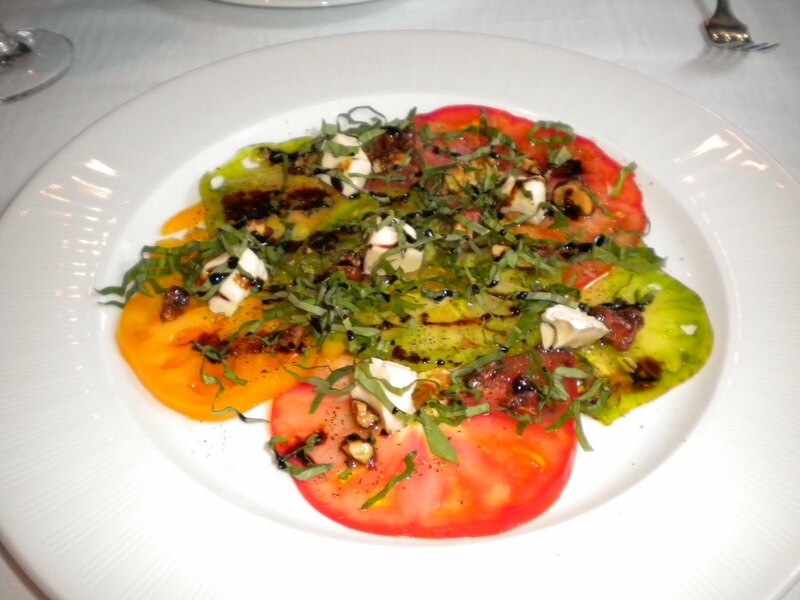 Heirloom Tomatoes, Brie and Peppered Walnuts. I was recently invited to sample the fare at the newly opened Fifth Street Cafe, the second venture by A.D. Allushi and ZaZa Pachulia - their first being Buckhead Bottle Bar. 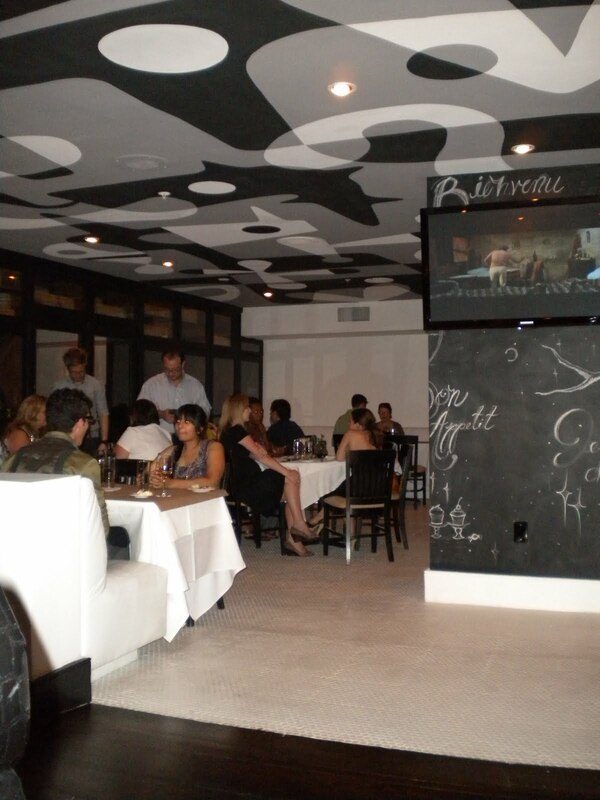 The look reminds me of Buckhead Bottle Bar, with black and white abstract designs covering the ceiling. My favorites included the heirloom tomato salad (above), which was quite flavorful and interesting with the unusual addition of brie. 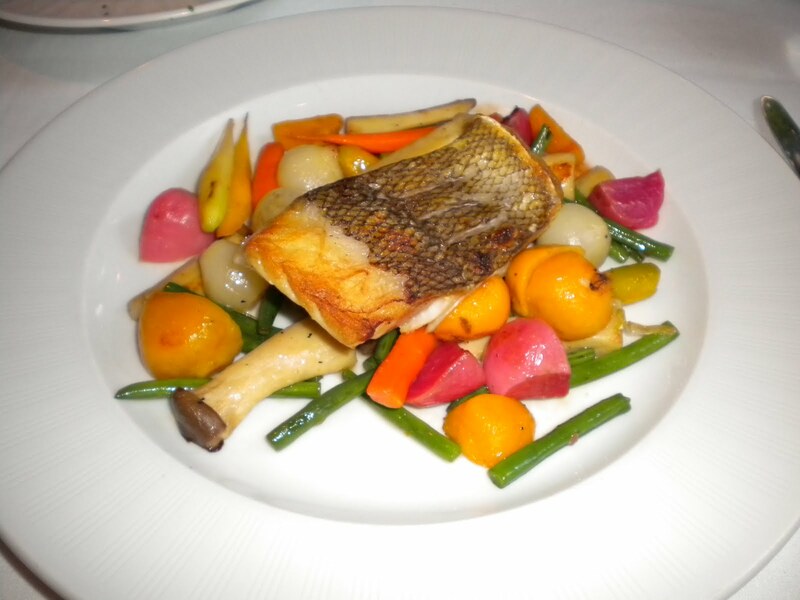 The vegetables served with the fish dish delighted the palate, with beets and mushrooms adding variety to the beautiful plate. The garlic fries were also delicious with loads of tasty garlic and the filet they were served with was solid as well - tender and juicy, cooked rare as we'd requested. 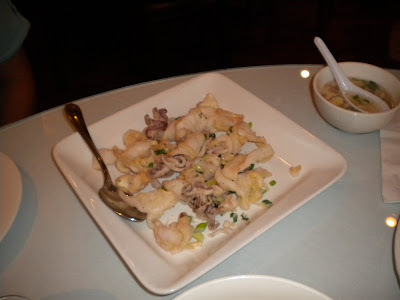 I was a bit disappointed with the calamari as it said it was served with hot and mild peppers but there was nothing at all spicy in there to me. The goat cheese tart was better - warm and tasty with the distinct caramelized onion flavor. Overall 5th Street Cafe looks to be a positive addition to the midtown dining scene. I'd love to see a little more creativity and bold flavor but I think the majority of diners will find something they can enjoy here. 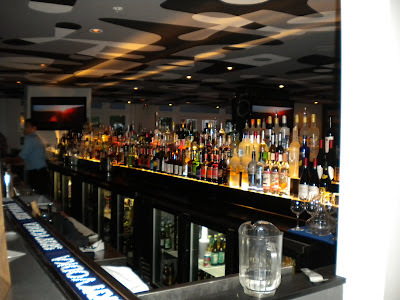 There is also a large bar and one end of the restaurant serves as a lunch cafe and dessert area. 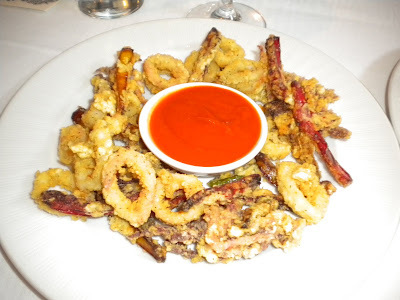 Fried Calamari with peppers and tomato sauce. Warm Goat cheese and caramelized onion tart. Fish of the day over seasonal vegetables - the vegetables were a standout. 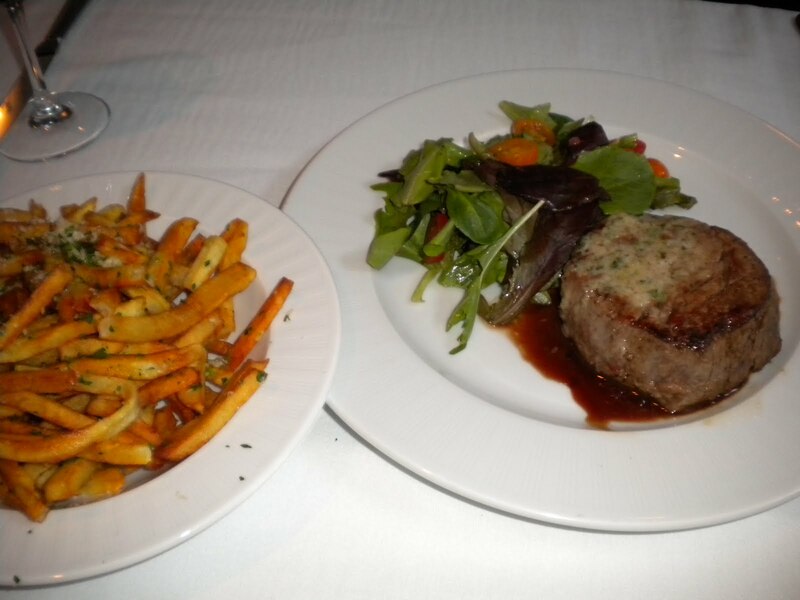 Filet mignon with garlic fries and herb butter. Chocolate orange mousse - light and tasty. 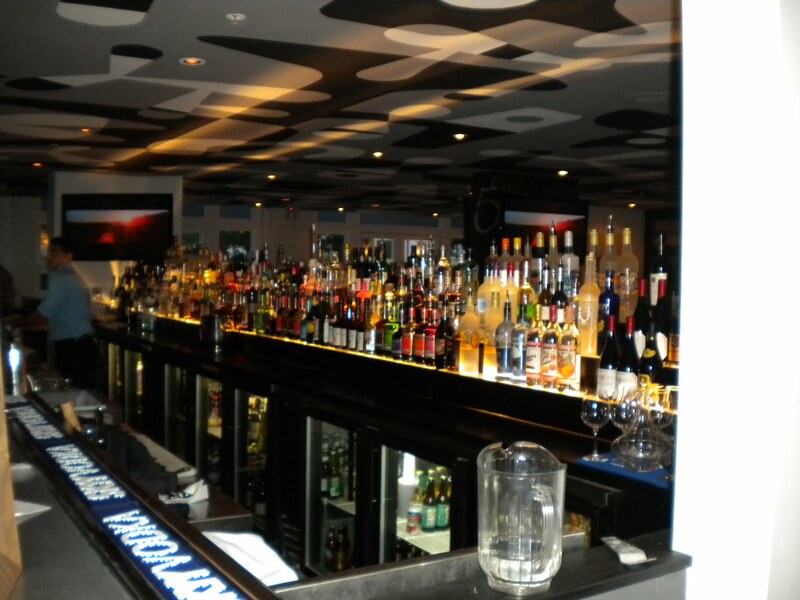 The scene - the decor is reminiscent of Buckhead Bottle Bar. I dined out for lunch with a friend recently at Anis Cafe & Bistro, located on Grandview Avenue in Buckhead. This adorable restaurant is owned and managed by native Frenchmen and we were delighted to hear French being spoken at several tables on the porch where we sat under an umbrella on a still hot September day. 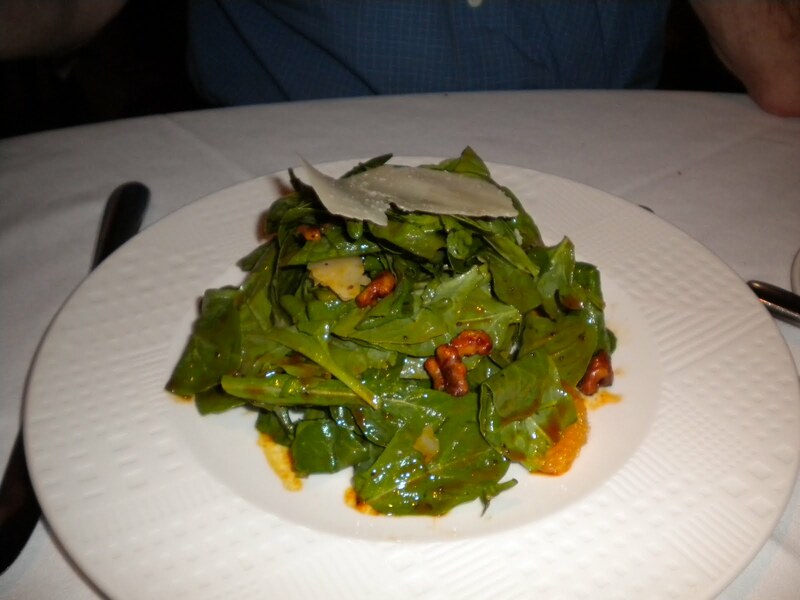 We started with the mussels (not pictured) which we inhaled before I thought of photographing them. As with good French mussels, they reeked of butter, white wine and especially garlic. The warm sliced bread served alongside made for perfect dipping, while the harder rolls went untouched. We opted to skip the fries, which are offered as an option to make a true "moules frites" - this would be a great entree choice, too. 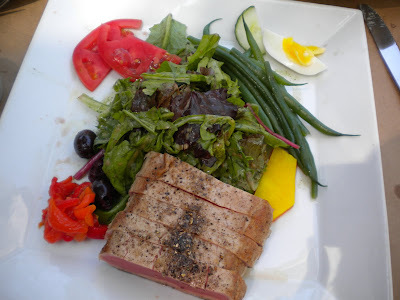 The above Salade Nicoise was perfectly executed with generous slices of seared Ahi tuna, a very light, tasty olive salad dressing and the requisite potato, pepper and egg offerings. 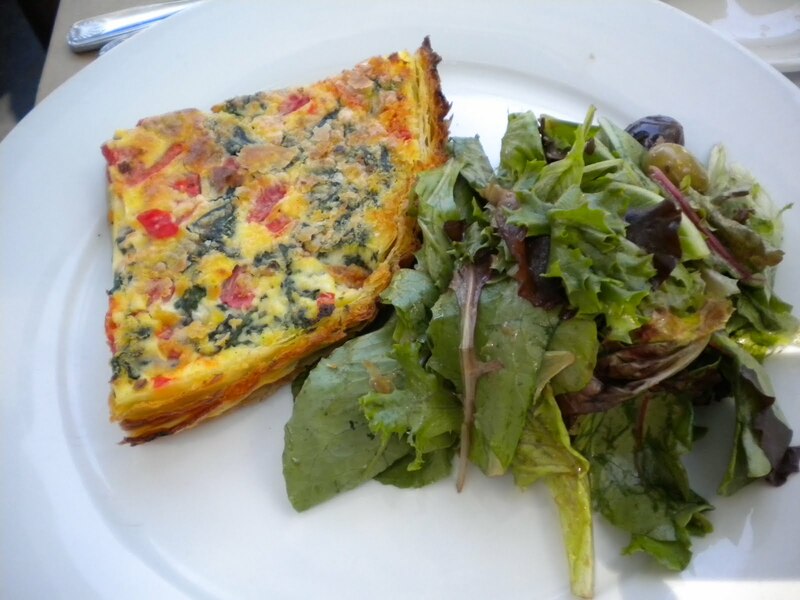 The below quiche of the day - tomato and spinach if I'm remembering correctly featured a light, flaky, delicious crust and a very classic quiche filling. For dessert we enjoyed profiteroles - a classic, playfully spruced up by the juxtaposition of chocolate ice cream in one and vanilla in the other. A perfect ending to a weekday lunch treat. Profiteroles - one chocolate and one vanilla. Steamed Red Snapper with Ginger Sauce. 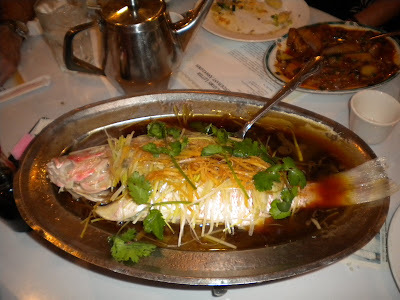 I have written about Little Szechuan on Buford Highway before, but found this dish I'd never had before noteworthy after dinner here with the extended family. 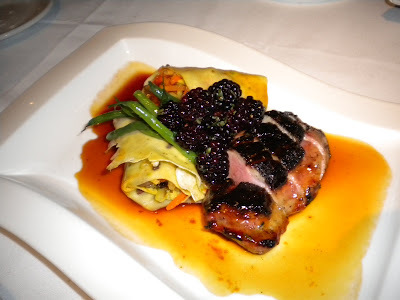 As usual the other dishes were excellent, too, although they did not provide the customary "free dish" as usual. 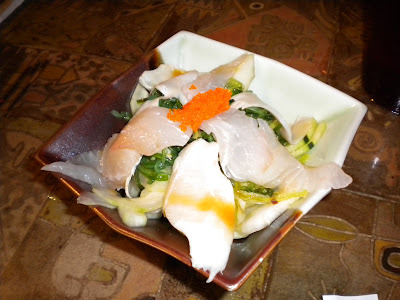 I was reminded again that the pickled cabbage, carrots and jalepeno peppers as well as the spicy bean sprout goodies they bring you upon arrival here contain some of my favorite flavors. Does anyone know other Chinese restaurants that provide these gratis snacks (or have them on the menu for purchase)? After a long day, we stopped by Dave's Cosmic Subs on a rainy Saturday evening for some subs. This small shop, which features a small outdoor (but enclosed) seating area is popular with Emory students. Delivery is available as well, which is a neat option if you live nearby. The sub options vary widely, the menu divided into Hot and Cold options, with the option of heating the "Cold" subs anyway. I always thought when passing by that this place might be a bit of a diamond in the rough and what we tried did not disappoint. The subs are HUGE, although 1/2 options are offered. Probably a better value to get the whole thing and save some for later! The meatball contained 3 enormous, tasty meatballs, tasty tomato sauce and lots of melted cheese. 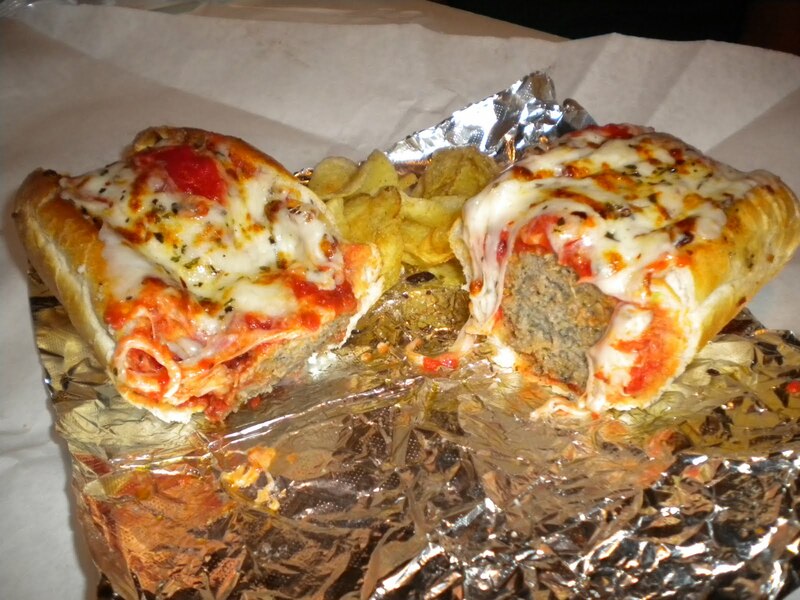 I'm actually not the biggest fan of meatball subs so for me to even like this at all is a good sign. 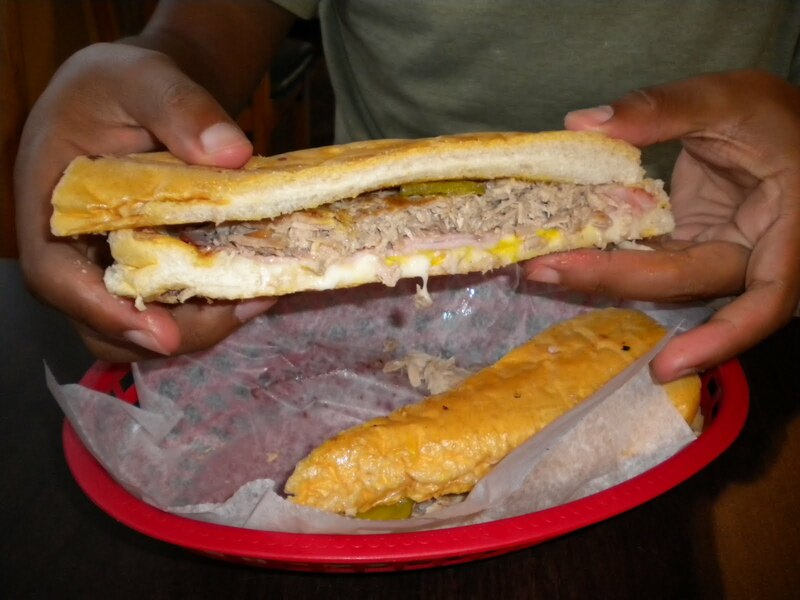 The Original Dave's Cosmic Sub (below) was also tasty, with lots of meat and flavor. Next time I go back I want to try Dave's Far Our Chicken and the chocolate dipped key lime pie - sounds divine. I noticed they do have a couple of veggie options, including a veggie burger sub. Another neat thing about going to Dave's is that they provide permanent markers for you to write with directly on the wall - of course there isn't much room left but something about that definitely takes me back to my own college days... Try it and let me know what you think! 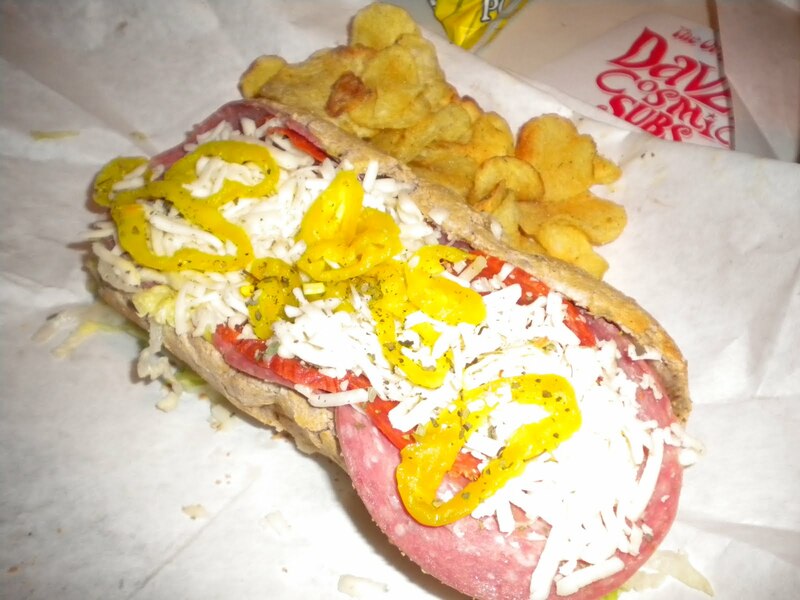 The Original Dave's Cosmic Sub - basically a glorified Italian. Jerusalem Rice Dish with sauteed Tofu and homemade Ginger sauce. 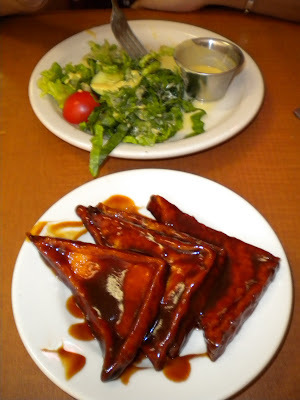 After passing this place multiple times on the way somewhere else, I decided to bite the bullet and try Soul Vegetarian Restaurant on Highland Avenue, just south of Ponce de Leon. The atmosphere is unique and rumor has it that slow service is the norm. It was a little slow (and not very crowded) on my visit, but not terribly so. 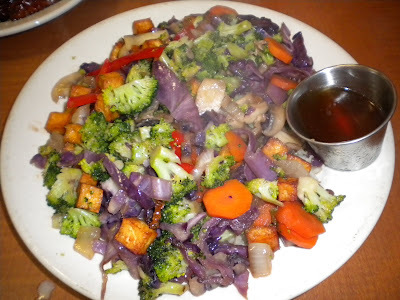 The above rice dish came out hot, tasty and probably did a lot for my veggie and fiber intake that day! Seriously, it was very good and my friend also enjoyed her BBQ tofu. She also ordered a side salad that came with a tasty garlic dressing. This place is totally vegan and is purportedly owned and run by the African Hebrew Israelites of Jerusalem, an interesting group to say the least. 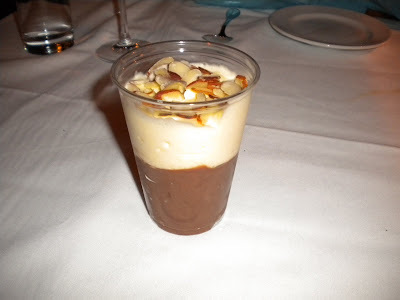 We had no room to try it, but the restaurant's Ice Kream (non-dairy ice cream) is something I'd like to sample. Garden salad and BBQ Tofu. On a recent trip down Buford Highway, Calvin and I decided to check out Havana Grill, which comes with its own family saga. You order at the counter, then sit down and wait for your food to arrive. We tried some maduros (not pictured) as well as the Cuban sandwich and the beef picadillo, served with beans, rice, bread and salad. Everything was really tasty, especially the black beans and rice, which could definitely stand alone in a big way. This place offers many traditional Cuban dishes and is in my opinion, the closest thing to the original Havana that burned down in 2008. Hopefully I'll be back soon to try something else! 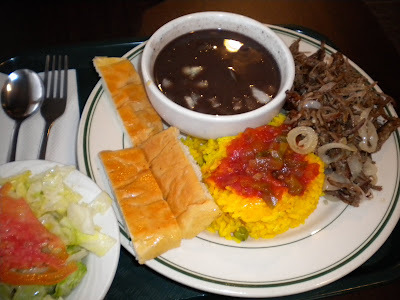 Beef Picadillo with beans, rice, salad and bread. 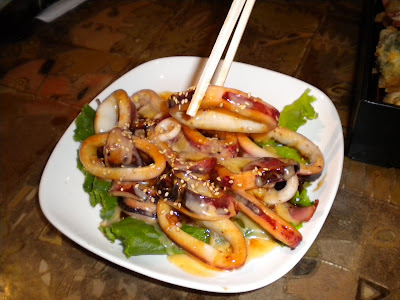 Grilled calamari in Spicy Sauce - very tasty! 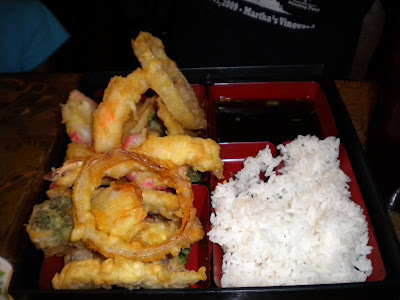 While we were in Memphis back in July, Calvin's sister took us out to Osaka Japanese Cuisine, which is conveniently located next to Sheridan's Frozen Custard. We indulged in both, with the grilled calamari above serving as the family favorite. 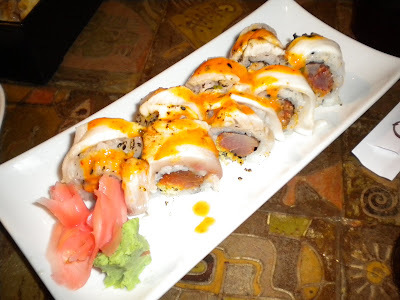 This place is quite a distance outside of the city of Memphis, but certainly a good choice if you are in the Cordova area. The only disappointment was that the owners are Vietnamese and not from Osaka - I was hoping to be able to practice my Japanese! Tempura dinner - delicious sticky rice. Below: two sushi rolls - the bottom one was spicy and creamy, the top one contained lots of fresh fish. I cannot recall their names! 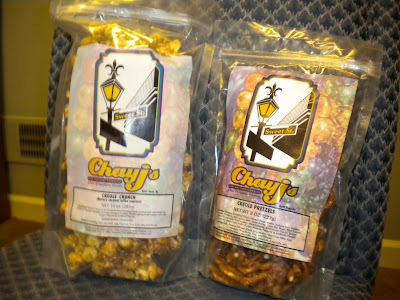 Creole Popcorn and best-seller Creole Pretzels. Entrepreneur Chay Powell sells delicious New Orleans-inspired goodies from her website, with delivery available in the metro Atlanta area. Some products are also available in local stores and restaurants including at one of my favorites: Crawfish Shack on Buford Highway. I received complimentary samples of the popcorn and pretzels and definitely think the Creole Pretzels are worthy of the sugar shock. Others I shared my samples with preferred the popcorn, but I really liked the salty/sweet contrast that the pretzels provide and I love that pecans are part of the Creole Pretzels - yum! Chay J's also sells pies, chocolate covered strawberries and pralines. Special orders for holidays, weddings or other occasions are also available.